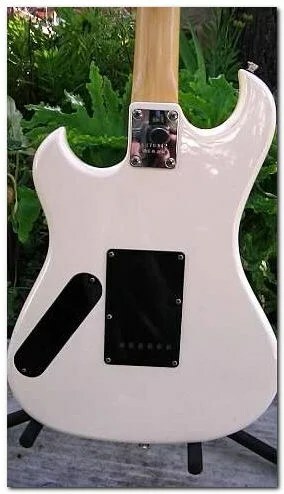 Similar shape to the 1985-6 Spectrum guitars, but without the beveled edge where your right elbow rests. Single bridge mounted humbucker, volume control (No tone control) and Fender style tremolo. 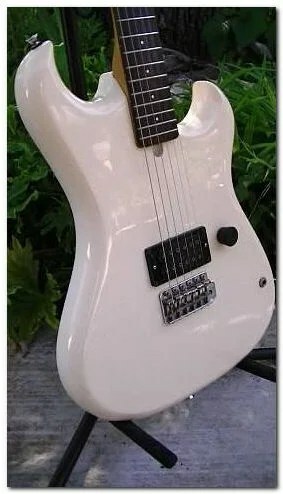 Given that it has a UBC (unbalanced coil) pickup, which were designed to overcome the inherent 50% volume drop when an ordinary humbucker is coil-tapped, it’s puzzling why there’s no coil tap switch, unless they were trying to produce an entry-level instrument as cheaply as possible. Info from the August 1986 US pricelist – this model does not appear in any of our other price lists. The X125 appears in the 1987 German catalogue. Strat-type trem, chrome hardware, single volume control and a Magnaflux I UBC pickup, available only in black. This beautiful white example courtesy of Forum member Gittarasaurus (Mike). 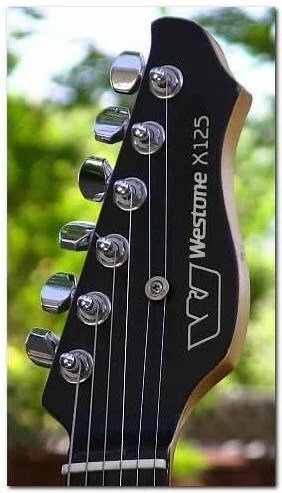 The spring cover is missing on this black example, and the tremolo arm isn’t original.